Ask any pet owner and they'll tell you: Furry friends are just as much a part of the family as actual humans. And this interior design trend proves it. A recent New York Times report pointed out that there’s a growing demand for designated showers for dogs in homes. Yes, you read that right: dog showers. Instead of giving pups a bath in the regular tub, some are opting to build a separate shower just for their pooch. As excessive as it might sound, it does make sense. William Harrison, principal architect of Harrison Design, said his firm has been designing dog showers for clients for many years. The appeal of a dog shower is usually for bigger breeds, not Yorkies, he explained. “You try bathing a big dog at home; it’s a big mess! Not only is the dog unhappy in the tub, but the suds, fur and water get everywhere," Harrison said. It can also be unsafe as wet dogs can get hurt trying to jump out of a slippery bathtub. 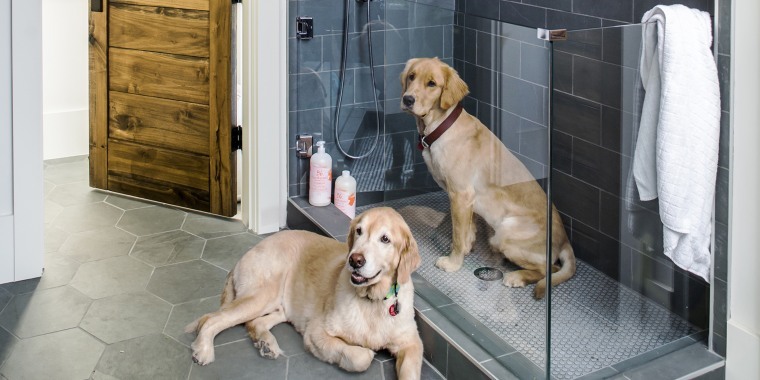 Most people add their dog showers to a mudroom or laundry room, and it’s actually not that costly to add a plumbing line to those areas, said Hannah Crowell of Nashville’s Crowell & Co. Interiors and a Trulia Design Panelist. Crowell is so into the idea of dog showers, she’s actually adding one to her home for her two retrievers. “I am almost more excited about the dog shower than I am about my own bathroom,” she told TODAY. Her pups love digging holes in her backyard, so they’re always covered in dirt. “I would much rather bathe them in a designated dog shower than have them track mud all through the home,” she said, adding that with a dog shower, the mess is contained and you don’t have to worry about doing a deep clean of the bathtub afterwards. Obviously a dog shower can be handy for those who have dogs, but does it won't hurt the resale value of a home if prospective buyers don’t have pets. Great for Fido and your bottom line!